The next phase of ambitious plans to improve the centre of Selkirk begins this month. Improvements to Market Place will run from Monday 21 August to Saturday 31 March 2018 to allow the £450,000 Selkirk Streetscape Scheme to be completed. The works are being phased to minimise disruption to visitors and traders whilst allowing construction works to be undertaken. During the works temporary bus stops will be used on the adjacent A7 road instead of the Market Place stop, while there will be times when parking in the Market Place is affected. Signage will be in place to advise members of the public that businesses in the local area remain open as usual. The streetscape scheme has been finalised after consultation with the Selkirk Stakeholder Group. This group is made up of representatives from organisations across the town, as well as members of the public during a drop-in session in September 2016. In addition, our officers will visit local traders in the coming weeks to give further details on the streetscape works. There have also been discussions with Historic Environment Scotland, Selkirk Conservation Area Regeneration Scheme (CARS), Transport Scotland and Amey. We are working closely with Transport Scotland and co-ordinating the streetscape works with works on the A7 road to maximise the benefits of the scheme. “The Selkirk Streetscape Scheme has involved considerable consultation with the Stakeholder Group which includes 15 different organisations from the town. “We believe the scheme will greatly enhance the town centre for local people and visitors, while retaining the important historical character of Selkirk. “While the works take place, we would encourage local people and visitors to continue to come to Selkirk and support our local shops. 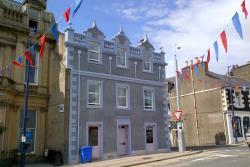 We are funding the streetscape works with Selkirk CARS providing part-funding for the scheme. See full size image on our Flickr page. The scheme has been developed with our Engineering Design team and landscape architects.